“This is like being in Istanbul,” my friend says, in between bites of his sandwich. Ömer, his fiancée, and I are sitting on the south bank of the river Main in Frankfurt, Germany. We’re soaking the late-summer sun. The grassy meadows are full of people: some in animated conversation; some surrounded by a big spread of food, beer, and wine; others kicking the soccer ball back and forth with their children. There’s a whole lot of happiness here, but there’s a long line of people, waiting to purchase food and drink at the boat parked by the riverbank. We just left that very same line after waiting for an hour. What we’re eating now made the wait worthwhile. Over the ten-plus years I’ve known Ömer, he’s never been wrong about food in Germany. We each have a fried-fish sandwich: lightly fried fish in thin crispy batter, crunchy lettuce, slices of juicy tomato, stuffed in fresh soft Turkish bread. There’s a choice of Sardellen (anchovies), Makrelen (mackerel), or Doradenfilet (gilthead seabream). Ominade, freshly-squeezed lemonade according to Oma’s (Grandmother’s) recipe, is the right amount of sweet-tart, providing cool refreshment for our afternoon snack. High praise from Ömer: born in Istanbul, raised in Köln, and who’s gone back to know Istanbul very well in adulthood. We’re silent over the next few minutes, chewing slowly and contemplating Istanbul. I’m realizing the obvious. If the food is any indication, I’m missing out; I’ve not yet visited Istanbul. But right now, I’m eyeing that long line: I want another fried-fish sandwich and lemonade. 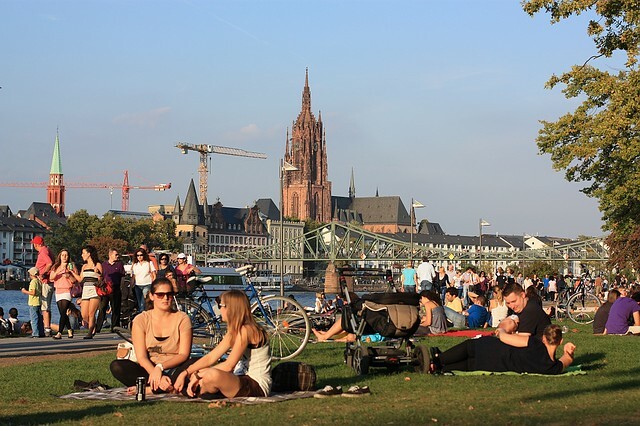 But I don’t want to move; this is summer-like weather on an early-autumn afternoon on the bank of the river Main. If you’re visiting Frankfurt am Main, make your way to the Main river to the boat called Meral’s Imbissboot (Meral’s Snack Boat). Naturally, they serve Döner, but their fried fish is too good not to try. Subject to weather conditions, the boat is open for service every day from noon to 11pm, between March and October. Public transport: nearest U-Bahn station Willy-Brandt-Platz or Schweizer Platz. I made the photos above on 3 October (German Reunification Day) 2011. This post appears on Fotoeins Fotopress at fotoeins.com as http://wp.me/p1BIdT-4n5. I jog past this all the time but I’ve never eaten here. I think I’ll have to before I go back to the UK! Hi, Charlotte, and thanks for your comment! That’d be a great compliment if you did, and an even higher compliment to my friend, should the food be as good as we had it. 🙂 Uhm, going back to UK for a visit, or “for good”? Hi and thanks, Tim & Nat! Right about now, I could use one of Meral’s fried fish sandwiches and that lemonade … mmm mmm good.